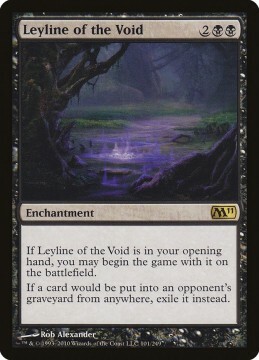 Leyline of the Void is an incredibly powerful card against Dredge. The best part about Leyline is that it only affects your opponent's graveyard. This means you can deploy it without harming your own Tarmogoyfs, Snapcaster Mages, or other cards that rely on your graveyard. You can run it in a deck that doesn't have black mana, but you'll have to aggressively mulligan to get it in your opening hand. 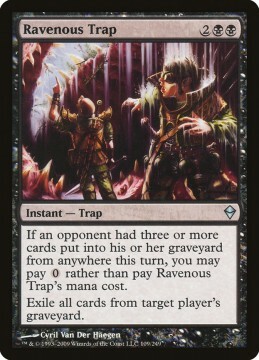 Tormod's Crypt provides a few advantages over other graveyard hate. It has zero CMC, which means any deck can utilize it without costing you tempo. It only hits one graveyard, so you can preserve your own. Finally, its ability can be used at instant speed (its cast at sorcery speed of course), so you can wait to deploy it until the best possible time. This is a conditional Tormod's Crypt with a surprise factor. In general, Tormod's Crypt is probably the better card.